In the world of microphones, the Helpinstill Piano Sensor™ is unique. The only magnetic pickup made for piano, every unit is hand-crafted with the attention to quality sound and precision design that established a world-wide reputation, and made Helpinstill the first name in piano pickups since the very first unit was bought by Elton John in 1972. Today, major artists, churches, and other state-of-the-art sound installations get a Helpinstill when only the best will do. In most applications micing the piano, it's the only thing that really works! They are only available directly from the manufacturer, Helpinstill Designs. The Model 280 Balanced-Line Grand Piano Sensor now is available with a new phantom-powered, low-noise FET-circuit control box. The Biggest Mistake You Could Make Micing Your Piano is to Use a Mic! We have been telling people for years that you can't use a mic on a piano to make it louder. The concept is simple: the SPL inside a piano is usually lower than the sounds originating around it. One tech recently called it, "The other room mic." 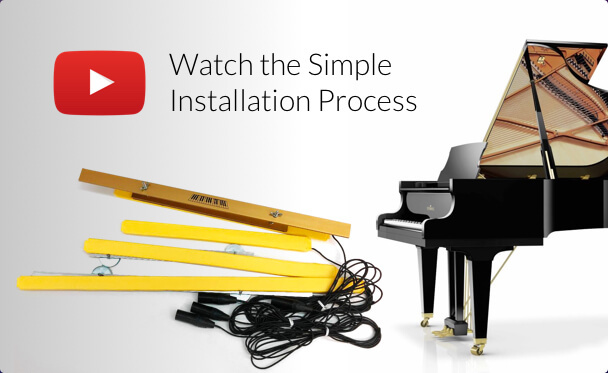 One mic system that Sweetwater calls "The Perfect Mic Solution for Piano!" is the DPA-4009P, listed at $1239.95 retail. Why is it so hard to mike a piano? "We are in love with the pickup. Not only did it carry us through our Jazz festival but it shined this past Sunday when our Steinway was competing with the 20 piece Cape Ann Big Band. The piano was tucked all the way stage right with a wall on one side, full drum set on the other, lid closed and a super reverb firing under the tail. I was able to just sit at FOH and blend it in with the horns without any concerns. Our DPA’s had no chance…tons of bleed and phasing. The Helpinstill didn’t even flinch. Thank you again for an amazing product!" "This is a total game-changer. Thank you! The model 280 arrived before 10am, we had it installed quickly, and for the first time in an amplified group setup, i can hear every note I’m playing with total clarity. Bravo!" The Helpinstill doesn't "hear" any soundwaves through the air, as when piano miking is usually done with microphones. It senses the string movements magnetically at the speed of light to produce a signal. When we hear this signal through speakers, we recognize it as the sound of the piano! For the same reason that feedback is practically impossible, the signal from the Helpinstill contains no sounds of other instruments around the piano. Unlike pickups on the soundboard that produce a wooden, colored sound, or conventional microphones, which can make the piano sound far away, the Helpinstill sends the original vibrations of the strings (the source of the piano's sound) directly to your speakers where the piano sound is reproduced. Every note on the piano can be exactly the same volume, eliminating dead zones and weak areas. The Helpinstill fits on a grand piano in about 15 minutes without tools. 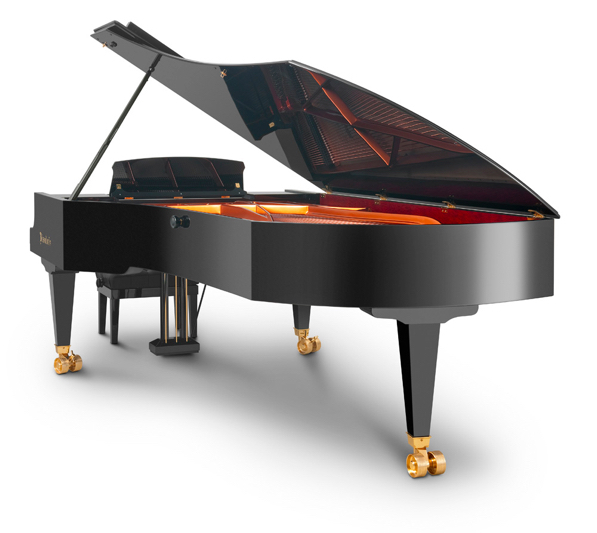 Nothing touches the piano except padded surfaces - no drilling, no screws, no adhesives. 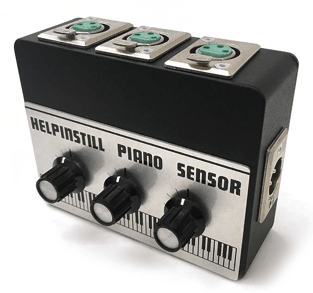 Our passive models use no batteries, no phantom or any other power. This means no upkeep on Models 120,125,180,135 or 280 & 240 (No Mixer). Other models with powered mixers just need a power connection, of course. If you're not convinced the Helpinstill is the answer to all your piano mic'ing problems, you can send it back to us anytime in the first 90 days for a complete refund, no questions asked. Want to buy Helpinstill today? Helpinstill Piano Pickups are solving the problem of hearing the piano clearly for congregations all over the country. Churches that spent $50-200,000 on sound systems, and $15-50,000 on grand pianos still couldn't hear the piano during the service, even with piano mic techniques using conventional microphones; now they are enjoying the piano for the first time. And if your church has a Contemporary Worship service, you've got to have a Helpinstill. Whenever piano is used in the company of amplified instruments, there is a need for faithful reinforcement of the piano sound. The Helpinstill systems accomplish this perfectly. 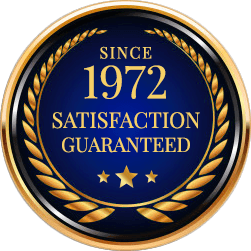 The original Helpinstill Piano Pickups used by Elton John, Billy Joel, Barry Manilow and hundreds of other acts in the 70's could take two hours or more to install! They put up with it for the sound, but you don't have to - the latest models take only about 15 minutes to put on, and sound even better. Helpinstill systems are currently on tour with Paul McCartney, Alicia Keys, Josh Groban, Lady Gaga, NIls Frahm, Coldplay, Low Cut Connie and many others, providing them with the purest, most versatile piano signal ever!